When we think of all-time great Porsche race drivers legendary European names like Herrmann, Behra and Ickx come to mind. And in discussions of Elford and Bell much is said of European drivers’ contributions to the world of Porsche motorsports. For sure, these legends of motorsport did much to raise the Porsche brand. But what about great Porsche hot shoes from the US? Have they been all but forgotten? We think not! We believe some of the greatest Porsche race drivers are Americans. If you dig deep to understand the success of Porsche Motorsports around the world, it is evident that American drivers have played a huge role in bringing notoriety to the brand both in the US and abroad. From Le Mans to Daytona, American drivers have recorded some of the greatest wins in Porsche motorsports history. These drivers are noted as Porsche masters and categorically driven to succeed in Porsche cars and Porsche cars only. They may have had forays into other teams and stints with other manufacturers, but when you think about the great achievements, it’s with Porsche where these drivers made their mark and a large part of how Porsche made their large footprint in global motorsports competition. To honor great American Porsche race drivers, we put together a brief list of five professional drivers from the good ‘ol USA who piloted Porsches to success in competition all over the world. Here are a our favorites – in no specific order of accomplishment, quickness or greatness. Mark Donohue – Born Haddon Township, NJ in 1937 – Famous for Driving: 917/10 and the 1,000+ horsepower 917/30 Can-Am car and IROC Carreras. Mark was educated as an engineer, but became a serious driver. He worked with Penske Racing and Helmut Flegl at Porsche to develop some of the most powerful Porsche’s ever including 917/30. He won the inaugural season of the IROC series in a Carrera RSR and set the Closed Course Speed Record at Talladega in the Porsche 917/30 running the car up to 221mph. During the development of the motor for the 917, German Porsche engineers often asked Donohue if the motor finally had enough power. His smug reply was, “it will never have enough power until I can spin the wheels at the end of the straightaway in high gear.” Sadly Donohue died in F1 practice for the Austrian Grand Prix in 1975 shortly after setting the record at Talladega. 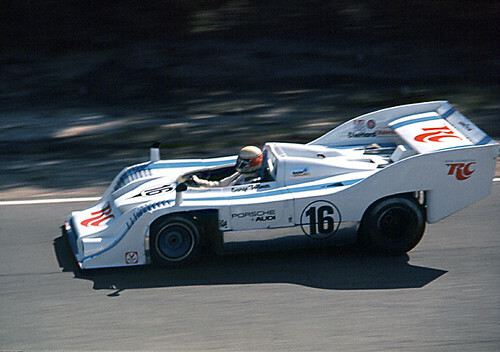 George Follmer Born in Phoenix, Arizona in 1934 – George Follmer was the 1972 Can-Am Champion standing in for Mark Donohue in the Penske 917/10. Follmer raced extensively in SCCA, NASCAR, dabbled in F1 and other major motosports series. Follmer took the 1976 Trans-Am Championship in the Vasek Polak#16 Porsche 934. Folmer continues to be active in vintage motorsports events keeping his driving skills very sharp. Check him out in this video as he flogs the Bob Akin 935/84 machine around Laguna Seca at the HMSA Charity Invitational. Peter Gregg- Born in New York City in 1940 – Peter Gregg was a 4 time winner of the 24 Hours at Daytona. In each of these races he piloted a Porsche. He purchased the Jacksonville, FL Brumos Porsche dealership in the mid 1960s from its original owner and won the 1973 and ’74 Trans-AM Series in his Brumos Porsches. Peter carried the Brumos Porsche racing programs through the 1970s with Hurley Haywood winning the 1975 Camel GT Series in new Carrera RSR. Sadly in 1980 Gregg committed suicide in Florida. It’s rumored that Gregg suffered from Bi-Polar disorder and that injuries which kept him from driving in some races deepened his personal sadness and struggles. His lasting legacy though is the winning years of Brumos Porsche in the world of professional and GT racing. Peter Gregg is forever a hero in the eyes of Porsche Motorsports enthusiasts and a legendary American driver.